The Strike King Mark Davis Jointed Structure Head has the same Cobra Head design as on the Structure Jig but features a free swinging Z bend black nickel hook which is designed to provide maximum bait movement during slow retrieves. When you crawl your lure along the lake bottom it keeps the lure in constant contact for superb feel yet is very weedless and has chip resistant Powder Coat paint. Attach your favorite soft plastic bait like a Rage Menace, Space Monkey, or Bug and see the incredible action as it bumps structure or moves across the bottom! 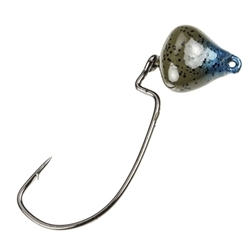 Also works great as a swimbait head with extra wobbling action!